NOTICE: Activation key must be used on a valid Steam account. Requires internet connection. About the gameThey fought for Freedom... They fought for each other. Vietnam, 1965. You are Dean Shepard, a cherry to the 'Nam with zero war experience other than standard boot camp training at Parris Island, SC. Along with your platoon, you will fight the NVA and the Vietcong in true historic locales and… battles such as Khe Sahn and the Tet Offensive, transporting you to a time and place American history that only a few can say they experienced firsthand. Key Features Experience the real Vietnam War - from Jungle-Based Ambushes to intense urban Firefights Unique battle chatter audio-re-creates the chaotic nature of combat 13 Action-packed combat missions spanning four authentic operations Rich detailed environments and realistic weaponry Pick your tour of Duty-Single-Player campaign or Multiplayer online combat for up to 24 players System Requirements Windows - Minimum OS: Windows XP / Vista / 7 / 8 / 10 32 or 64 bit Processor: 1,5 GHz Memory: 512 MB de mémoire Graphics: DirectX compatible video card with 64 MB VRAM DirectX : Version 9.0c Hard Drive: 4 GB d'espace disque disponible Sound: DirectX compatible Sound card Windows - Recommended OS: Windows XP / Vista / 7 / 8 /10 32 or 64 bit Processor: AMD/Intel dual-core processor running at 2 GHz or higher Memory: 1 GB de mémoire Graphics: DirectX compatible video card with 128 MB VRAM DirectX : Version 9.0c Hard Drive: 4 GB d'espace disque disponible Sound: DirectX compatible Sound card	© 2016 by Nordic Games Licensing AB, Sweden. Licensed exclusively to Nordic Games GmbH, Austria. Developed by 2015. 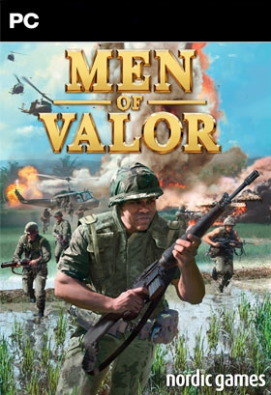 Men of Valor is a trademarks of Nordic Games. All rights reserved. All other trademarks, logos and copyrights are property of their respective owners.